A parody of "My Shot" from the musical Hamilton, a PSA series that informs voters about the voter ID documents they need to ensure that they're not turned away from the polls. The story of Dingle Film fest organizer Maurice Galway, through the "Dingle-ization" of classic movie scenes. West of Broadway, a non-profit theater company, founded by Diane Namm is dedicated to promoting literacy, classics and providing affordable interactive theater to the community. Our mission has expanded to promoting social and civic responsibility through theater. See my "You, the Jury" series described below. 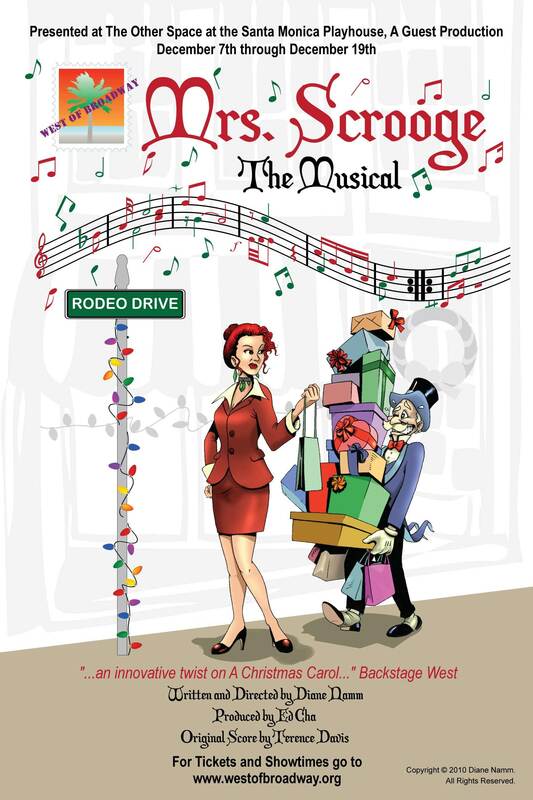 MRS. SCROOGE at the SANTA MONICA PLAYHOUSE Dec 7 through Dec 19. SNOWBALL FIGHT! The second production in West of Broadway's YOU THE JURY series. Playedin the fall of 2009 at Write Act Theater in Hollywood. Agenda Magazine's review of "12 Angry Jurors"
Tolucan Times review of "12 Angry Jurors"
"The Sacrifice" is a short drama about what happens on the day a polygamous cult leader comes to take a reluctant 13-year-old girl as his wife. DECEMBER 2009 www.westofbroadway.org Whip up the perfect holiday recipe for the family. Take a grumpy Mrs. Scrooge, stir in some grumpier ghosts, sprinkle a couple of angels on top -- and be sure to add a snow-ball fight finale and you've got Dickens's "Christmas Carol" story told as it never has been before. The best way to make this Christmas one that you're family will always remember. Bunny Tales Episode IV: BUNNY WARS based on Beatrix Potter's "Tale of Peter Rabbit"
Peter's not a baby bunny anymore. He's a "Luke Skywalker" rabbit and he's ready to take back the cabbage patch and rescue his dad from Sgt. McGregor. Join Peter and his bunny army in this zany anti-war retelling of this best loved tale. Can you say food fight? MONSTER is the first production in the "You, the Jury" TM series of courtroom dramas. At the Carrie Hamilton Theater (Pasadena Playhouse) this February. Coming to the Edgemar Center for the Arts in March. MONSTER is a world premier stage adaptation of the National Book Award finalist young adult novel by Walter Dean Myers. The story of 16-year-old African American Steven Harmon, on trial for murder, for allegedly being the lookout in a robbery gone bad. Designed for high school students, the "You, the Jury" tm series allows audiences to serve as the jury, and vote for the guilt or innocence of the defendant. MRS. SCROOGE Namm's wacky tale inspired by Dickens's "Christmas Carol" is a zany holiday recipe for family fun: take a couple of mischievous angels, a grumpy Mrs. Scrooge, and sprinkle in an audience filled with snowball-throwing angels and a snowball fight and you've got the quintessential family tradition for Christmas entertainment. BUNNY TALES EPISODE IV: THE BUNNY WARS teenage Peter Rabbit enlists young audiences to help him wage vegetable warfare on Sgt. McGregor to take back the cabbage patch and rescue his father. "HUCK" inspired by Twain's "Adventures of Huckleberry Finn" takes audiences on a river ride in which Huck and Jim set off in search of treasure and adventure, only to discover there's no place like home. "Red Chief!" inspired by O.Henry's "Ransom of Red Chief" tells the tale of Red Chief, sugared up and ready to roll on Halloween night, who gives the adults in charge a run for their money along with a well-deserved fright. "Greed" a horror/​thriller about a woman who discovers that her greed just might cost her her life. "Pranksters" a family comedy about two thirteen-year-olds who wage a practical-joke war on their dating parents to prevent a family merger. 2007 California Independent Film Festival selection for "Best Screenplay"
"Reality Strikes" a reality-show horror series. Diane's adaptation of Leroux's "Phantom of the Opera," Margaret Sydney's "The Five Little Peppers and How They Grew," a medley of "Animal Stories" by Jack London, Mark Twain, Harriet Beecher Stowe and more, and a collection of "Greek Myths" for the Classic Starts series, published by Sterling Publishing, a division of BARNES & NOBLE. Coming 2011 10 titles by Diane Namm for upcoming Fairy tale series: Jack and the Beanstalk, Puss 'n' Boots, Princess and the Pea, The Ugly Duckling; The Emperor's New Clothes; King Arther and his Knights; Three Little Pigs; Goldilocks and the Three Bears; The Gingerbread Boy and The Frog Prince. Adaptations of Kipling's "Jungle Book" and Lofting's "Doctor Dolittle" for the Easy Reader Classics series, published by Sterling Books. Laugh-a-Long Readers: Funny Bunny Jokes; Jungle Jokes; Slithery, Squirmy Jokes; Silly Jokes. based on Rachael's road to the Olympics. “You, the Jury,”TM, a series of interactive courtroom dramas. distributed by Shorts TV International and is available on itunes. currently on the film festival circuit,with a world premiere at the Dingle International Film Festival in Ireland in March, 2010 and a win as Best Comedy Short at the Route 66 Film Festival. Diane is the writer/​producer on the upcoming Documentary-comedy, "We'll Always Have Dingle," a story about the Dingle Film Festival, working with director Geoff Wonfor (History of the Beatles) and writer/​director for SASA: A Light in the Dark, a documentary of events taking place on the India/​Burma border. 1999 AFI Television Movie Award for "Warrior Queen," based on the life of Queen Boadicea of Iceni. 2007 KidsFirst! 'seal of approval' for "Pranksters"
2007 Top Ten of "Abbreviated Screenplay" Competition for "The Sacrifice"
2008 "Audience Choice Award" at Holly Shorts Film Festival for "The Sacrifice"
Directed by Diane Namm. Produced by Pasadena Playhouse and West of Broadway. Based on narratives written by Pasadena Unified teens in Diane's writer-in-residence workshop for the playhouse in May 2008. Born out of a workshop that was an adjunct to John Steinbeck’s Of Mice and Men, - Big Dreams in Pasadena gave four young writers a chance to see their work performed on stage. Steinbeck’s story is about thwarted hopes and dreams and about friendships when those hopes are shattered. The four young writers in this workshop ( Deleah Davis, Kelsea Mayfield, Sharay Traylor and Morgan Tucker, used these ideas for their narratives. Instead of going for Steinbeck’s tragic ending, Big Dreams in Pasadena ends on a far more positive note. Directed by Diane Namm the play was presented in the intimate theatre upstairs from the Pasadena Playhouse, home to Furious Theatre Company. Big Dreams is a modern day filmmaking challenge the young people have taken on via You Tube. The idea is to create a film, edit and post on line in twenty-four hours. It has to be done on a Macintosh laptop (which the actors did on a Dell with a picture of apple hurriedly pasted on the front of the laptop for good measure) - This caused a good laugh when the audience realized the joke. They (the four teens) hope to come away from the experience with fame and fortune. Instead, the teens find something far more valuable. The play is about 50 minutes long and features professional actors Rafael Noble, Jessica Jones, Chioma Nwosu, Rick Vargas, Jaimyon Parker and Nichole Joubert. Two of the authors participated in the real Apple 24 hour film competition. The production is a joint effort of the Pasadena Playhouse and West of Broadway Theatre Company. Malibu Times article on "Child Marriage in America" 7-17-08 about "The Sacrifice." Reading Is Fundamental of Southern California partners with West of Broadway to promote literacy, classics and a new generation in theater. Sterling Publishing's Little Acorns are briefly told adpatations of children's best loved fairy tales. Diane Namm adapts GREEK MYTHS, ANIMAL STORIES, PHANTOM OF THE OPERA and FIVE LITTLE PEPPERS. "A Christmas Carol," "Adventures of Huckleberry Finn," "Tale of Peter Rabbit," and "Ransom of Red Chief." Timeless classics adapted especially for beginning readers.